Isn’t it interesting that it is the third world countries, Europe and China that are starting the movement of banning plastic bags that chokes our planet’s coral reefs, oceans and its animal inhabitants. Not even taking into consideration the horrible beaches in poorer locales where it washes up on the shore and just left. What is the United State doing on the plastic bag ban? The U.S. started with small grass root plastic bag bans in San Francisco, California. All of California has mostly adopted the plastic bag ban along with Hawaii and many other state locales following. There is still a strong legislative hold out for the bans in most states because of….you guessed it….oil production. Yet an estimated 500 billion to 1 trillion plastic bags are used worldwide every year. 380 billion in the United States alone with the government still slow-moving at best to do anything about them. Now any Kenyans who produce, sell or even use plastic bags will risk imprisonment of up to four years or fines of $40,000 starting this month. It is the world’s toughest law aimed at reducing the plastic pollution. The East African nation joins more than 40 other countries that have banned, partly banned or taxed single use plastic bags, including China, France, Rwanda, and Italy. The bags drift into the ocean, strangling turtles, suffocating seabirds and filling the stomachs of dolphins and whales with waste until they die of starvation. “If we continue like this, by 2050, we will have more plastic in the ocean than fish,” said Habib El-Habr, an expert on marine litter working with the U.N. Environment Programme in Kenya. Plastic bags, which El-Habr says take between 500 to 1,000 years to break down, can also enter the human food chain through fish and other animals. In Nairobi’s slaughterhouses, cows destined for human consumption sometimes have as many as 20 bags removed from their stomachs. “This is something we didn’t get ten years ago but now it’s almost on a daily basis.” Kenya’s law allows police to go after anyone even carrying a plastic bag. But Judy Wakhungu, Kenya’s environment minister, said enforcement would initially be directed at manufacturers and suppliers. “Ordinary “wananchi” will not be harmed,” she told Reuters, using a Kiswahili word for “common man.” It took Kenya three attempts over ten years to finally pass the ban and not everyone is a fan. Samuel Matonda, spokesman for the Kenya Association of Manufacturers, said it will cost 60,000 jobs and force 176 manufacturers to close. Kenya is a major exporter of plastic bags to the region. “The knock-on effects will be very severe,” Matonda said. 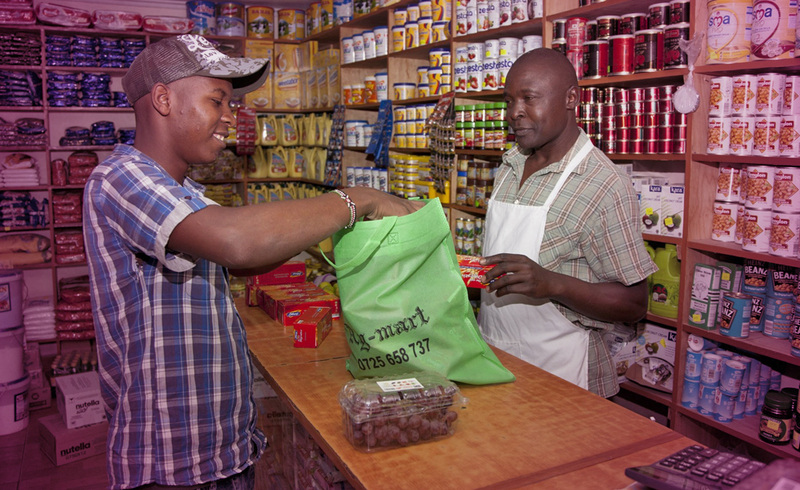 “It will even affect the women who sell vegetables in the market – how will their customers carry their shopping home?” Big Kenyan supermarket chains like France’s Carrefour and Nakumatt have already started offering customers cloth bags as alternatives. Small step for a huge problem if not addressed now, will signal the end of earth supporting humanity as we know it. This is of course, a severe approach but I feel in general the Kenyan people are rooted to the elements and sense the dire need of this drastic law to save their country. Their beaches are destroyed and now the poisonous dangers of polyethylene is working its way to their food chain. A man of power, control, the need to be right and have the last word. I feel this is the energy behind this plastic ban. No middle road, either my way or jail. This may also represent the makers of plastic bags, as they had no backup plan on how to get rid of them once they cluttered the planet and didn’t care. Feminine loving energy and of generous heart. Since inverted, it represents the energy of how casually humanity has discarded plastic without any loving regard to the planet they live on. Romantic energy and a dreamer. Pulled inverted, I feel there was at one time hope that Kenya could solve their plastic pollution without being so forceful but found they were naïve in thinking so.